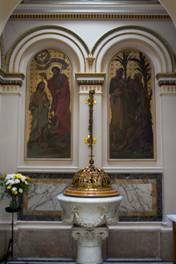 When parents wish to present their child for Baptism they are invited to contact the Parish Office, 01 4972215. We will discuss the dates of Baptism, take the initial information and arrange a meeting in the week before the Baptism with the priest who will celebrate the sacrament. Baptisms are scheduled twice each month usually on Saturday at 1.00pm. The policy of the parish is to have a number of children baptized together to create a true sense of joining a community of believers, single baptisms are not encouraged. Families who may wish to invite a priest friend to join the parish celebration are most welcome. Please click on Baptism Request Form below if you wish to complete the form before you contact the Parish Office. Thank you. Baptism is the gateway into the life of Christ and the Christian community. Baptism celebrates the embrace, through Christ, of a relationship with God. It confirms that the baptised is a Child of God, a follower of Christ, a temple of the Holy Spirit and a member of the body of Christ – the Church. Parents are requested to make contact with the Parish office. We will assist with arranging a date for the Baptism and schedule a meeting with one of the priests of the parish.